The final three players have agreed to a chop deal. 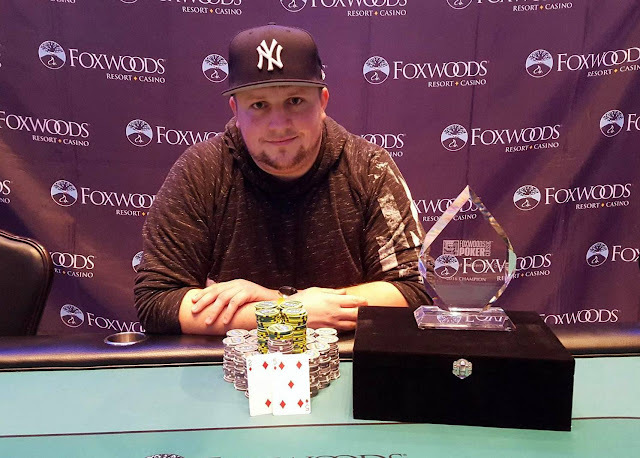 Anthony Campagna will take 3rd place for $10,000, Kevin Foley will take 2nd place for $10,000, and Shane Friedlander will take 1st place, the trophy, and $12,267. Congrats to the final three players. There were a total of 48 entries into today's $300 H.O.S.E. Event. 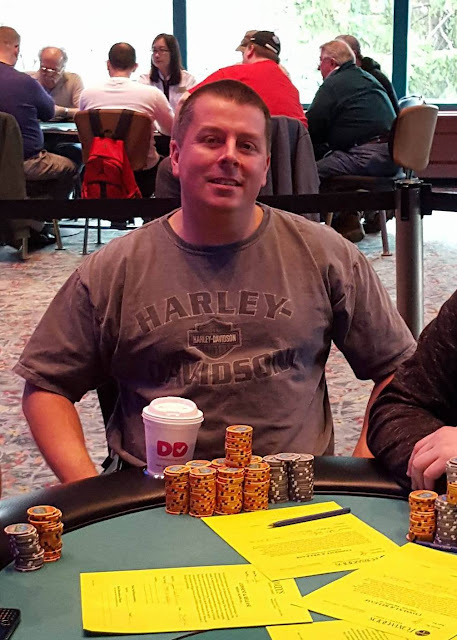 There were a total of 116 entries into today's $300 No Limit Hold Em Semi-Turbo Bounty Event. 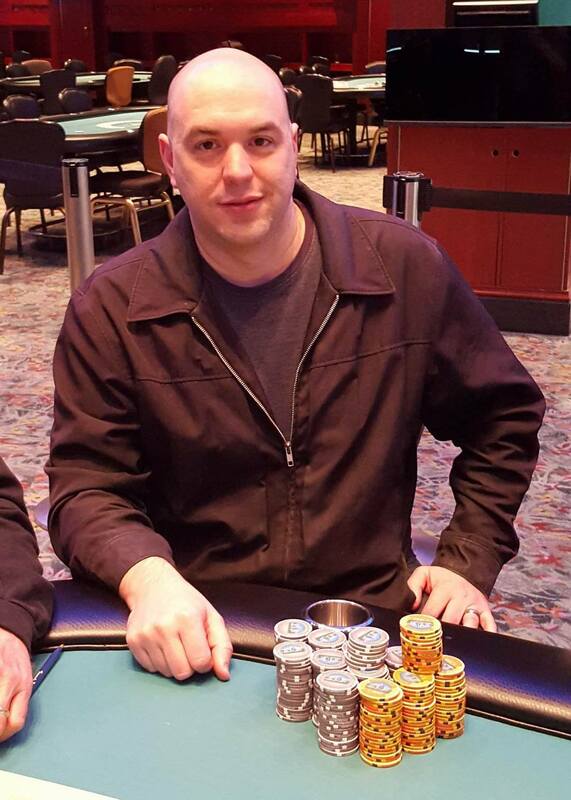 Anthony Campagna raises to 125,000 on the button, and Shane Friedlander shoves all in from the big blind. Campagna quickly calls. 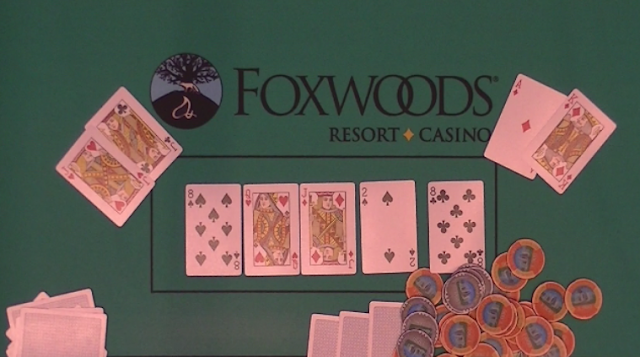 The flop comes [jc][6h][2d], giving Campagna the lead with a pair of jacks. The [kh] comes on the turn, and the [jd] on the river, ensures a full double for Compagna. 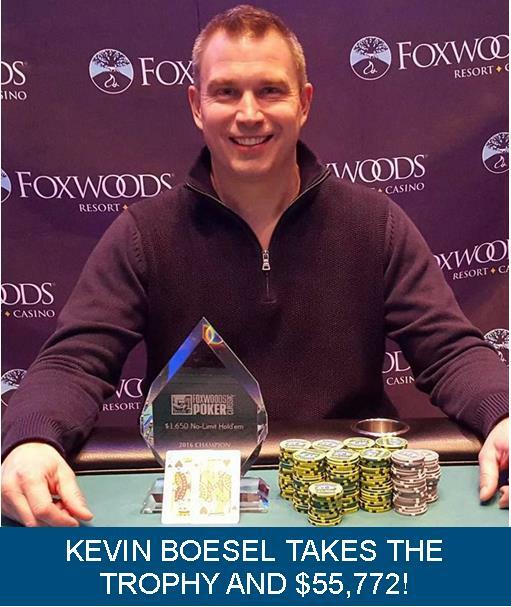 Kenny Roy shoves all in on the button, and Kevin Foley calls in the small blind. 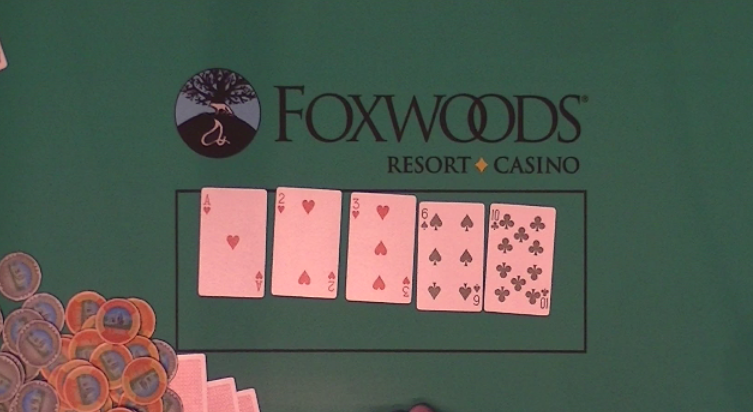 Foley moves even further into the lead when the flop comes [ac][qc][js], and he flops a set. The [ah] on the turn gives him a full house, and the [2h] comes on the river. Roy is eliminate in 4th place taking home $5,012. 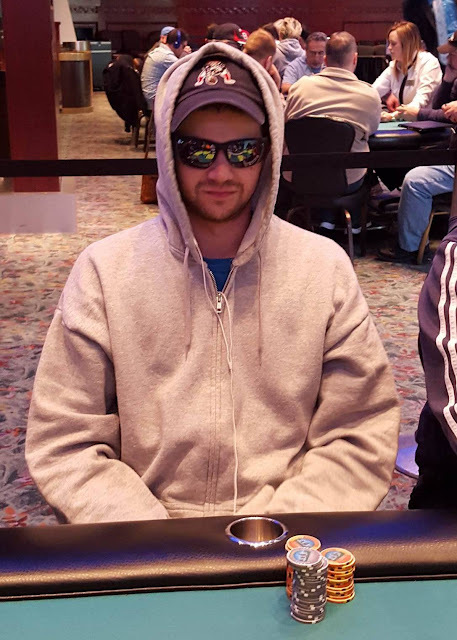 Barry Rosenkranz is all in and has been called by Shane Friedlander. The board runs out [kh][jh][js][jc][2h]. 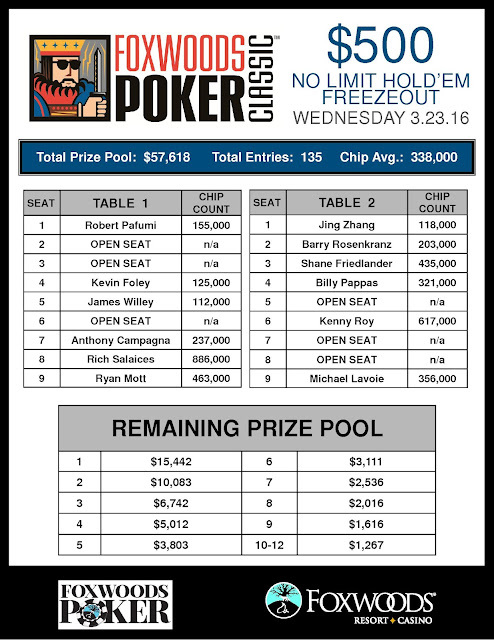 Friedlander makes a full house, and Rosenkranz is eliminated in 5th place, paying$3,803. 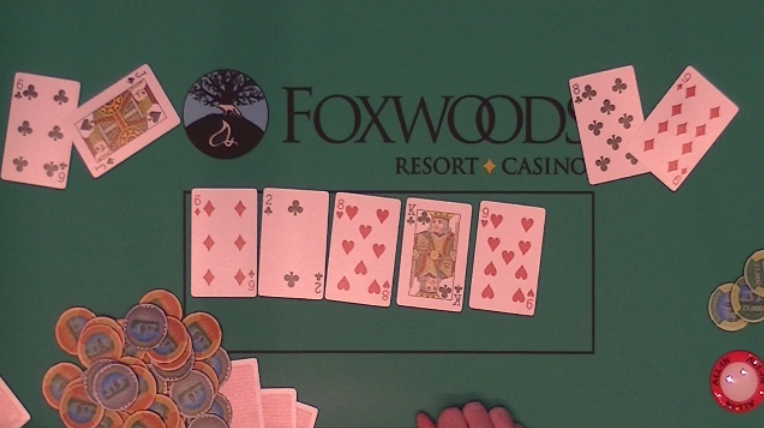 Action folds to Shane Friedlander who shoves all in from the cutoff, and Rich Salaices shoves all in for less from the button. 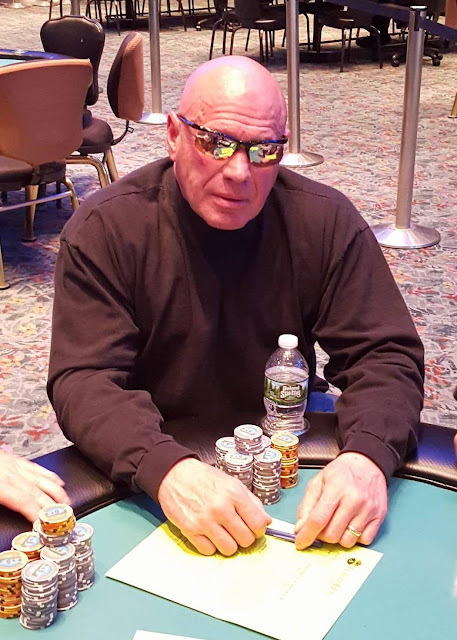 The small blind, Anthony Campagna, asks for the counts, and upon hearing the 400,000 total for Friedlander, and 300,000 total for Salaices, he mucks his hand, as does the big blind. The board runs out [9h][8s][4h][5c][9s], eliminating Salaices in 6th place, with a $3,111 payday. 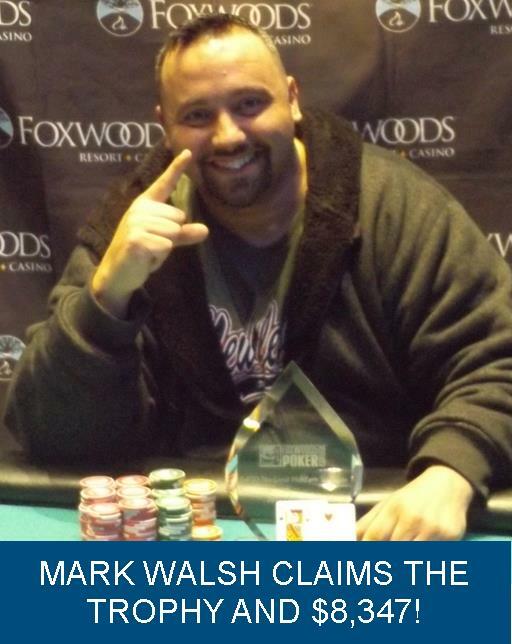 Barry Rosenkranz shoves all in and gets called by Shane Friedlander. The board runs out [ac][qc][8h][3c][7h]. Rosenkranz will double with his two pair. On a board reading [ah][2h][3h], Billy Pappas is all in holding [ad][7d], and has been called by an opponent holding ace-king. Unfortunately for Pappas, the [6s] turn and [10c] river do not improve his hand, and he is eliminated in 7th place, paying $2,536. Barry Rosenkranz calls on the button, and James Wilsey shoves all in for 73,000 from the small blind. Shane Friedlander calls in the big blind, as does Rosenkranz. Friedlander shoves all in when the flop comes [ah][6c][5s], and Rosenkraz folds. Friedlander shows [as][3d] for a pair of aces, and Wilsey says, "You are way ahead," as he turns over [jc][8d]. The turn is the [9c], and the river the [3c], eliminating Wilsey in 8th place, paying $1,616. 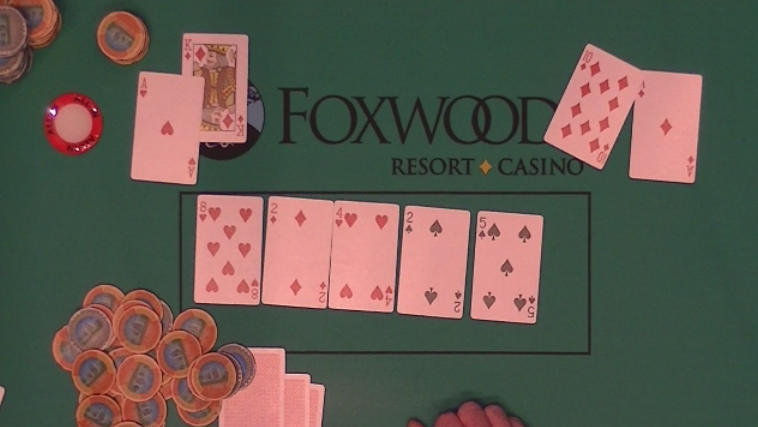 Kevin Foley shoves all in, and James Willey calls on the button. The board runs out [8h][2d][4h][2s][5s]. Foley is awarded a full double up, and Willey is left with around 75,000 in chips. On a board reading [6d][2c][8h], Rich Salaices shoves all in for 120,000 from the small blind, and Billy Pappas calls in the big. 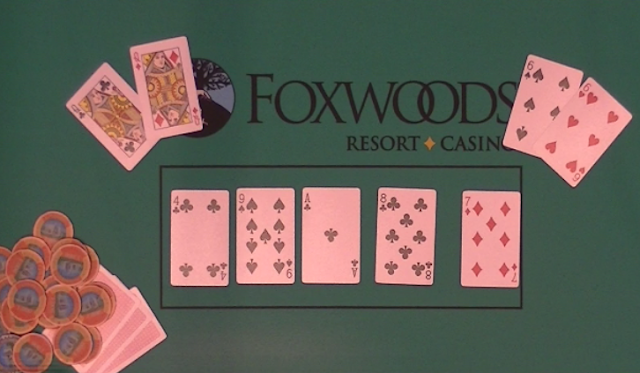 The [kc] comes on the turn, and the [9h] on the river to give Salaices two pair, awarding him a full double up. 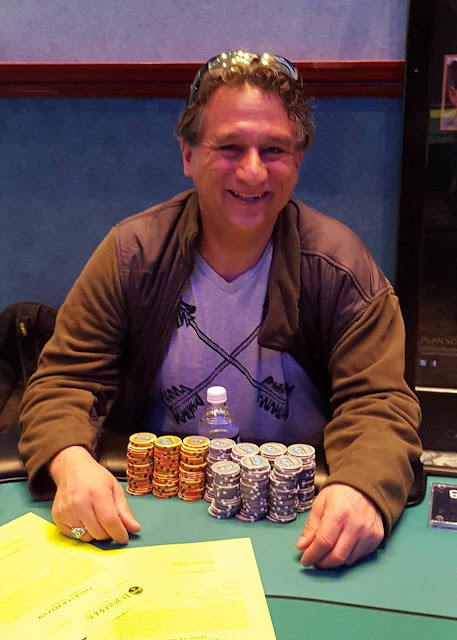 Shane Friedlander raises to 63,000 in the hijack, and Rich Salaices shoves all in from the cutoff. Billy Pappas shoves all in for less on the button. Friedlander goes into the tank and after a few minutes, folds his pocket nines. 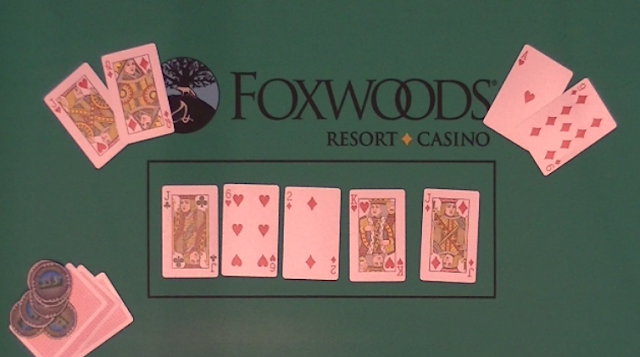 The flop comes [qh][jd][8s], with Pappas flopping a set of jacks. The [2s] on the turn does not change the hand, and the [8c] river gives Pappas a full house, and a full double up. 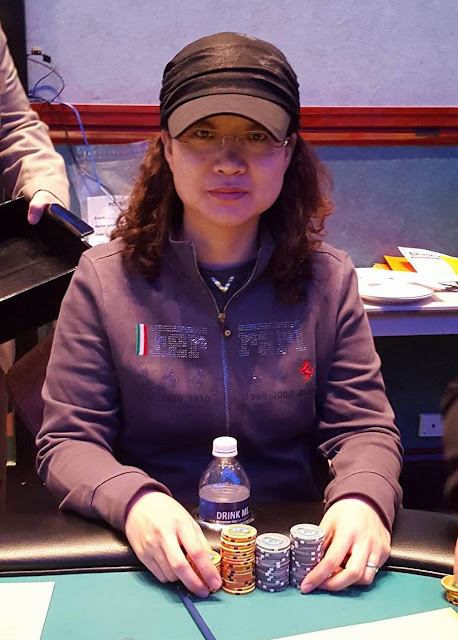 Jing Zhang shoves all in, and two opponents called. Both players checked it down as the board ran out [qd][5s][4d][7c][ah]. Zhang showed [qh][jd], but an opponent showed pocket kings to take the pot and eliminate Zhang in 9th place. Anthony Campagna raises to 50,000 in middle position, and Barry Rosenkranz calls in the cutoff. 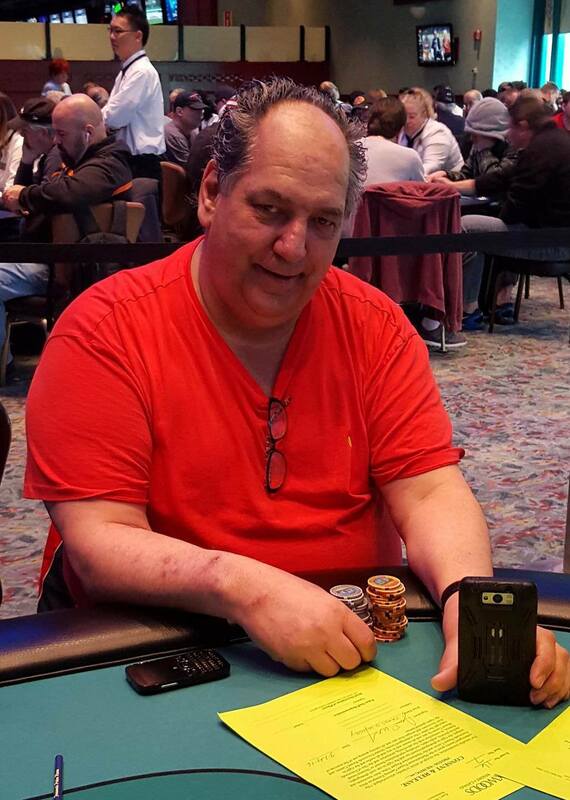 Robert Pafumi shoves all in for 72,000 on the button. The player in the small blind asks about his ability to raise/re-raise. The floor clarifies, and the blinds both fold. Campagna and Rosenkranz both call and check it down as the board runs out [jh][2h][2c][4c][3h]. Campagna shows [qd][qc] and Pafumi shows [jd][10d], and Rosenkranz mucks his cards. There are currently 45 runners in today's $300 HOSE event. Right now they are playing level 4 (75/150 blinds, 25 ante, and 150-300 Limit). 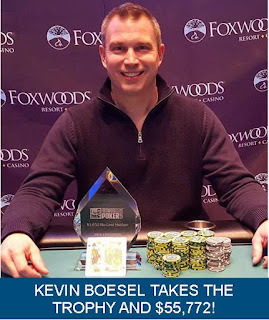 On a board reading [qs][9d][4s], Kevin Foley checks in the big blind, Robert Pafumi bets 50,000, and Foley shoves all in. Pafumi calls. 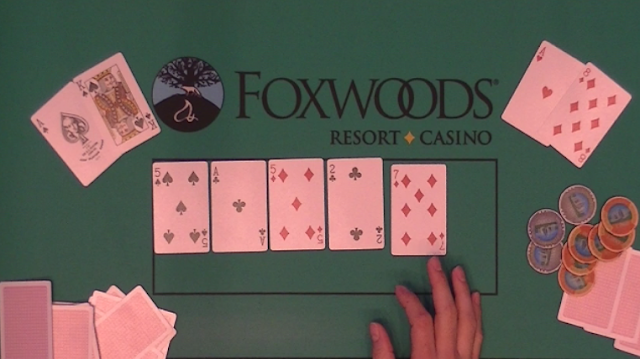 The [7s] turn and [ac] river do not change the outcome of the hand, and Foley is awarded a full double. James Willey shoves all in, and Rich Salaices calls. The board runs out [4c][9s][ac][8c][7d], awarding Willey a full double. On a board reading [3s][2d][3d], Barry Rosenkranz shoves all in, and Robert Pafumi calls. Fortunately for Rosencranz the [js] turn and [8s] river do not bring the flush cards, and he is awarded a full double up. Ryan Mott shoves all in, and Robert Pafumi calls on the button. The board runs out [5s][ac][5d][2c][7d]. 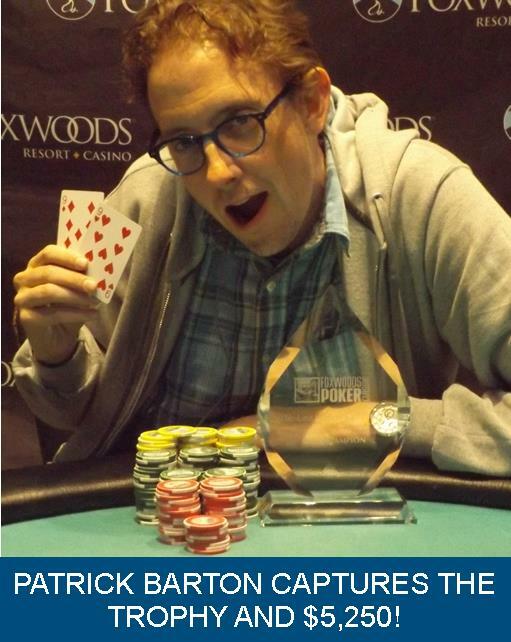 Pafumi's king kicker will play, and Mott is eliminated on the final table bubble in 11th place. 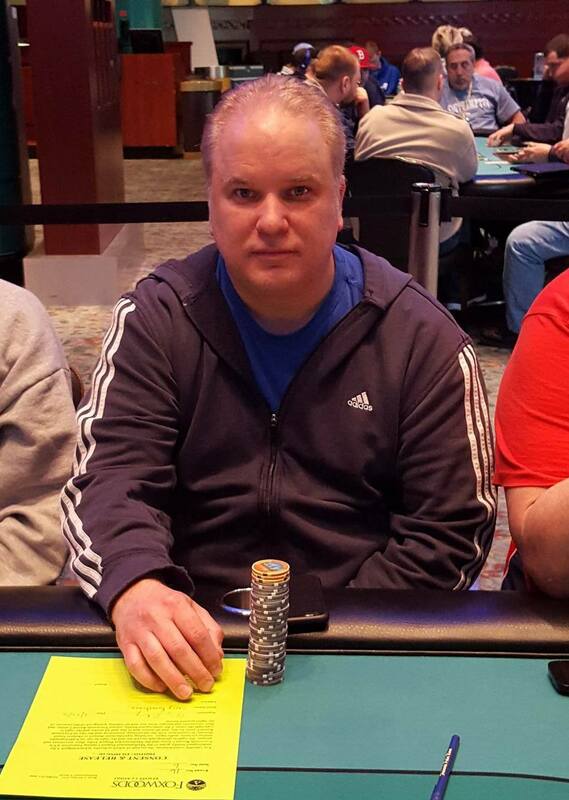 Action folds to Kenny Roy in the small blind who raises to 25,000. Michael Lavoie re-raises to 110,000. Roy shoves all in, having Lavoie covered, and Lavoie snap-calls. The flop comes [7d][4d][3d]. 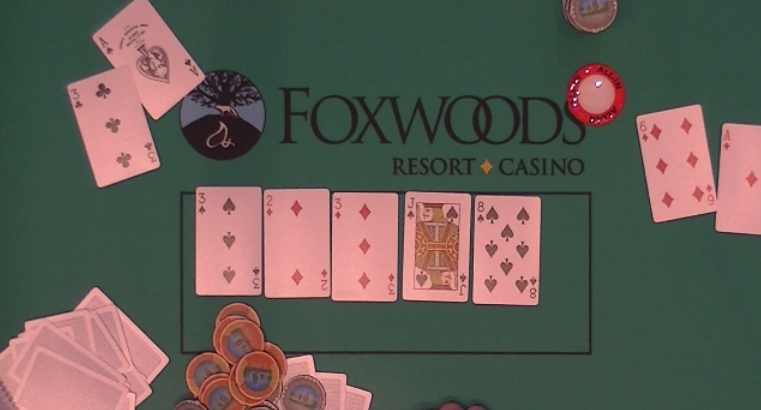 In addition to his higher ace, ,Lavoie also picks up the diamond flush draw, but Roy hits one of his two-outers when the [9s] comes on the turn. Unfortunately for Lavoie, the [10c] river does not improve his hand, and he is eliminated from play in 12th place. Event #18 is now under way. 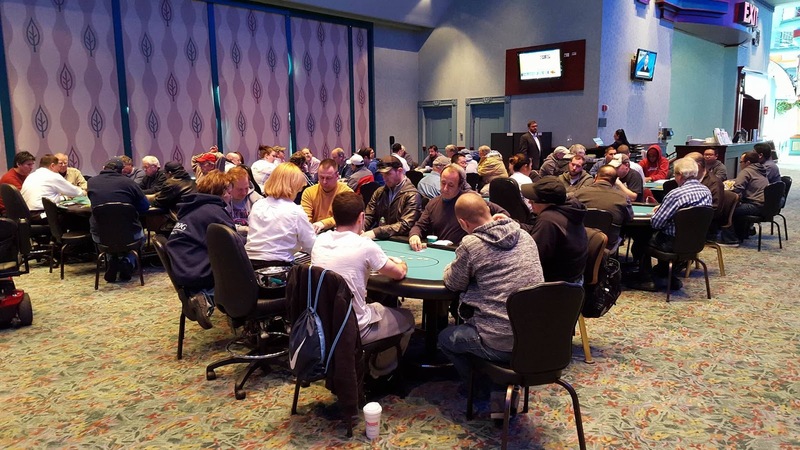 Players start with 30,000 in chips, and will play 20 minutes levels 1-15 (levels 16+ will play 30 minutes). Knock a player out and receive $100! Anyone wishing to enter/re-enter has until the start of level 11 to do so.